As a client, have you ever wondered if your SharePoint vendor is eating their own dogfood? We don’t know about anyone else, but at Lets Collaborate I can assure you we do. So to prove it, we thought we’d show you what we use SharePoint for as well as the challenges we face. For those of you that know the LC story, you’ll know I was on my own for the first 3 years. My staff compliment quadrupled in the space of 3 months around 18 months ago. I had to very quickly get a working intranet up and running because I was a major bottleneck in my own company. Due to major time constraints and sudden growth, I didn’t have the luxury of endless months of analysis. I had to consolidate my C:drive, Dropbox folders, 3 hosted SharePoint Foundation sites and my external hard-drive into one intranet that the team could access to they could do their jobs, all literally overnight. I thought this process would take me 2 weeks – 4 months later I wasn’t even close to being finished. I just gave up and developed and uploaded on demand. Not ideal I know, but this is a very real world scenario. I moved us onto Office 365 because they could offer me the space I needed, remote access from anywhere, as well as Enterprise SharePoint. They also take care of all the infrastructure which saves us costs and provides sanity. We upgraded to 2013 a few months ago and this is our current intranet structure. It’s not perfect by any means but we have a lot of content on there. My entire business is managed using SharePoint. The credo is simple here; if it’s not on SharePoint, it doesn’t exist. Is it beautiful? No. Is it working? Yes. I don’t go to our intranet to be impressed by fancy pictures, I go there to get operational information that helps me make better decisions about my business. We use site columns but no content types at all. Every single library created has a security level column on it that is compulsory. We only use metadata, no folders. Search works like a dream. There’s no workflow in place. We only send links, not attachments. We hardly use My Sites, especially now that we have Yammer. We’ve got 4 site collections, mainly for test environment purposes. One is left on 2010 so we can service our clients still using that. Our main intranet is on 2013 and that site collection has 7 subsites. There’s no separate team sites, it’s all on the intranet sites because we’re small enough for that. I’ve got restricted access on a few financial and HR libraries, but the rest is open to everyone. I keep an eye on my cashflow, budget and debtors book on a weekly basis. I’ve got views on the invoices library that shows me our income per financial year and month since our first month of operation so I can pick up trends and manage the cashflow. All our policies are in site pages with cross reference links to each other and updated every 6 months. All our company info and internet presence info is shared so staff can answer queries from the public with confidence. I’ve got alerts on just about everything for targeted information I need to know. For example, it’s company policy to monitor all training evaluations, (we primarily offer training after all). Any rating of 3 or under and I get an alert so I can follow up with the client and we log an OFI (opportunity for improvement). We maintain a database of every person that’s come through training in a custom list with views per client, per demographic, per financial year, per course, you name it. We are able to extract reports for our clients in seconds on demand. Jade manages all the registers and the training calendar from here. We manage all the training material that has to be created and printed. We manage the curriculums and discus ideas on improving the training on just about a weekly basis. Trainers upload signed registers and Jade does certificates from those. Research material is stored and shared so we can keep our skills up to date. I allocate tasks to the team and myself on demand. We maintain a pipeline of new business and projects register to keep track of things on the go. We store all client related docs online so they’re backed up and searchable with one point of the truth. Our timesheets are in the form of a custom list that we have totalled views on for invoicing purposes. We do events management here as we run SharePoint Business Workshops and SharePoint Saturday Jhb, as well as host an LC party annually. We use it for special projects like the new business analysis phase that’s just started, and my annual MVP documentation. We have all the governance in place and ongoing internal training program which also gets managed here. Now that systems are better defined and everyone knows what they need to do – and I have a Jade! 🙂 – I will be able to dedicate the time to restructure the intranet, redefine some processes and automate them. I haven’t been a fan of using 3rd party tools in the past, but now that we have discovered proper business uses for Yammer and Nintex, I have to admit they certainly allowing us to expand, enhance and optimize the way we work; but it’s been a process to get there. We were just not ready for this level as a business 18 months ago. We also have new offices that we share with our partners, so there’s even more opportunity for improved collaboration across this partnership and office management. I want to better define and document processes so we can scale out faster. 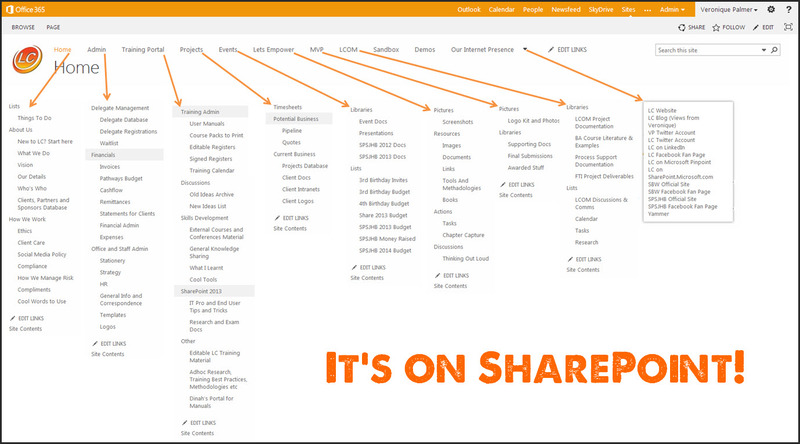 SharePoint is going to be one big online operating manual. Really looking forward to making our intranet much smarter and more efficient for the team and to support our planned expansion! Watch this space for the outcome. Very interesting article. I am currently redesigning structure of our old SP w3.0 (I call it dead web), moving onto SP 2013 foundation. You mentioned that you don’t use any folders, only meta data. How do you organise files and documents then? Considering I would move shared drive data onto SP without folder structure, ending up with thousands of documents unmarked (obviously manual memo assignment on each file) + phone calls where are their files, I am loosing my hair already. Thank you for article, inspiring.